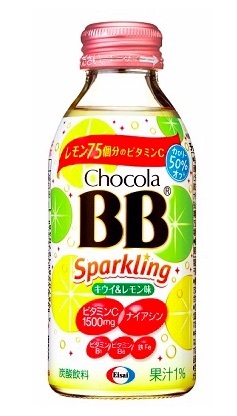 TOKYO, Apr, 08 2019 - (JCN Newswire) - Eisai Co., Ltd. will launch its new carbonated beverage Chocola BB Sparkling Kiwi & Lemon Flavor, classified as a Food with Nutrient Function Claims, in Japan on Tuesday, April 9. Chocola BB Sparkling Kiwi & Lemon Flavor is a new carbonated beverage classified by the Japanese Consumer Affairs Agency as a Food with Nutrient Function Claims (Niacin), and is the newest product flavor of the Chocola BB Sparkling series which has been well received mainly by working women since the series? initial launch in 2011. The drink contains five ingredients that help bring out women?s beauty from within, including 1500 mg of vitamin C which is equivalent to 75 lemons, in addition to vitamin B1, B6, iron, as well as niacin to help maintain the health of skin and mucosal membranes. Compared to the original Chocola BB Sparkling Grapefruit & Peach Flavor, calories have been reduced by 50% (24kcal).